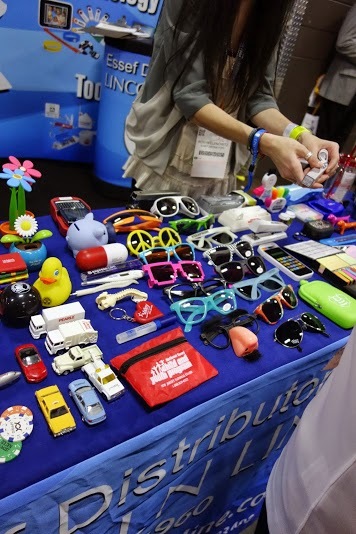 One of the best spots to pinpoint promotional products trends is at The PPAI Expo in Las Vegas, the promo industry’s largest tradeshow and the country’s 53rd largest show, according to Trade Show Executive magazine. 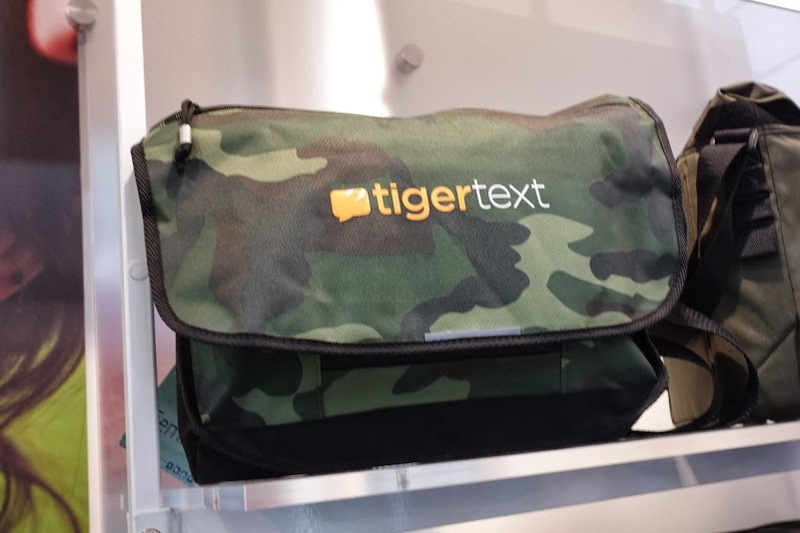 Last week, ePromos had a team of more than 20 trendspotters traversing the aisles at The Expo, on the lookout for the latest trends in custom logo merchandise. We covered more than six miles of tradeshow aisles, got a look at 600 new product introductions, and saw the latest offerings at 3,300 booths. So, what’s hot in promos this year? Tech is a leading trend – from cell phone chargers to Beats-style headphones. There’s also a trend toward outdoor promos – from colorful sunglasses (which were offered by a surprising number of suppliers) to cool camo products that blend in with nature but help your brand stand out. It’s no surprise that Beats-style headphones (made popular by Beats by Dr. Dre headphones) bumped their way to the top of our trends list – headphones were among the top-selling electronic gifts this past holiday season, accounting for 13 percent of the $8 billion in consumer electronic sales between November 24 and December 7, according to research firm NPD Group. Why the trend toward audio gear? Because for many, it’s an affordable luxury in a shaky economy. 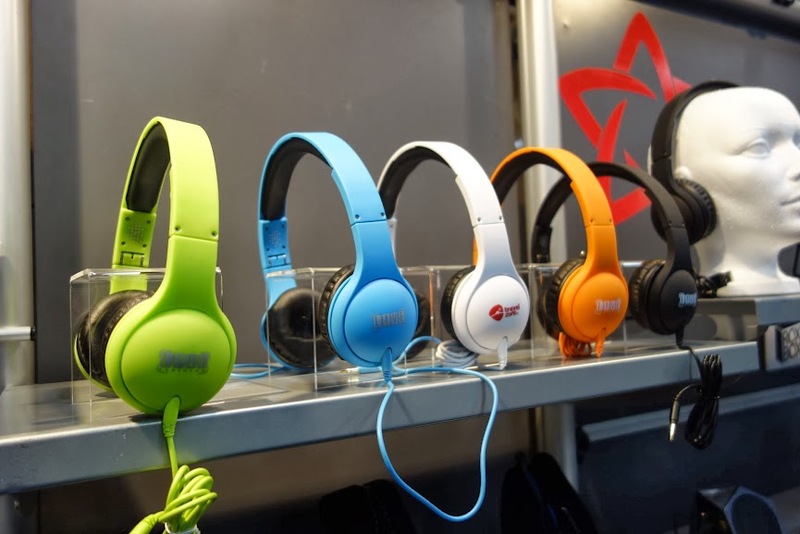 What’s popular at retail often shines in the promotional products market, and headphones were hot at this year’s show. No doubt some of the hottest items on the tradeshow floor were custom cell phone chargers. They were everywhere – and in every color and style imaginable. We spotted chargers in vibrant fluorescent hues (more on that trend later), car chargers with glowing logos, and handy portable chargers to power up smartphones and other USB devices when the power’s out or while you’re traveling. Bright neon hues have been big in the fashion world for many seasons, and the trend has officially taken over the promotional products market. We saw the neon trend really take off in the drinkware category – especially in tumblers and cups with straws. For marketers wanting to make a bold impression, neon is a smart choice. It brings energy to promos, and the eye is immediately drawn to bright shades. 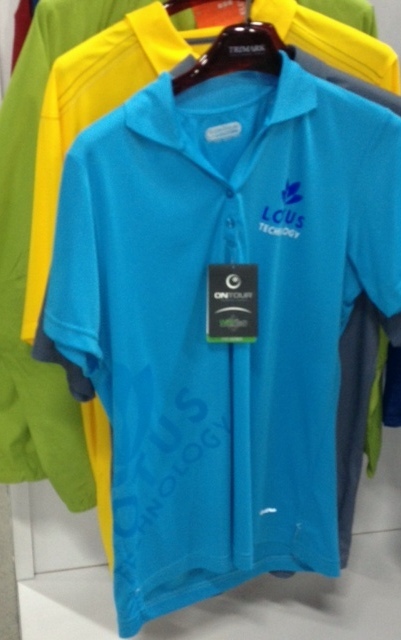 Another standout trend at The Expo was laser embellishments – on everything from awards to apparel. Suppliers showcased a variety of sharp, hi-def patterns on a multitude of materials. The result? Designs and logos that last as long as the item itself. When you’re looking to do something distinctive with your promos, laser embellishments bring out the design to get your logo noticed. Translucent is out, matte is in. 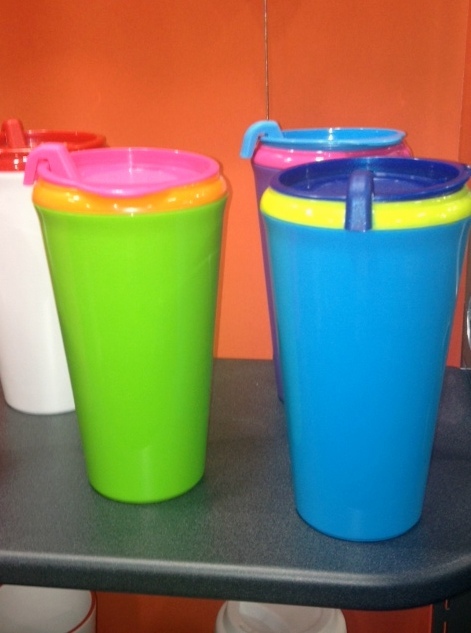 Matte finishes were a major trend at the show this year, popping up primarily in drinkware. It gives products an intense shot of color, and it makes the logo stand out crisp and clear. 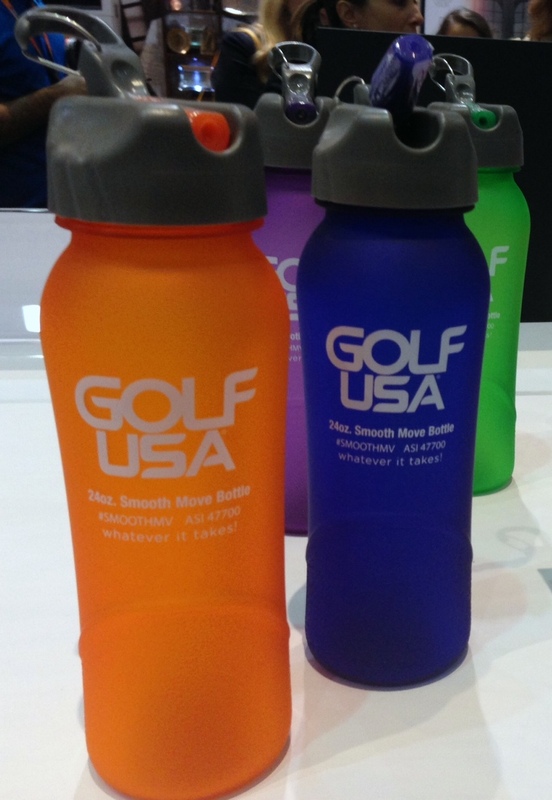 Pair the matte finish with neon colors, and you have a recipe for an undeniably modern promotional campaign. Camo was a running theme at the show, with suppliers offering up an array of camo products at all different price points. We spotted classic camo t-shirts made new with longer lengths and lighter-weight materials, and as for camo gear, hunters and outdoorsmen have their pick – everything is offered in camo this year. We saw cooler bags, thermoses, hydration packs, pocket knives, and even rubber duckies in a camo theme. Promotional sunglasses are a huge trend again this year – they’re being carried by more and more suppliers. Neon wayfarers, with their boxy shape and thick, colorful frames, stole the spotlight, but we also saw classic aviators and novelty frames (how about a peace sign over the lens?). For marketers looking for a great spring or summer giveaway at an affordable price point, sunglasses are the way to go. 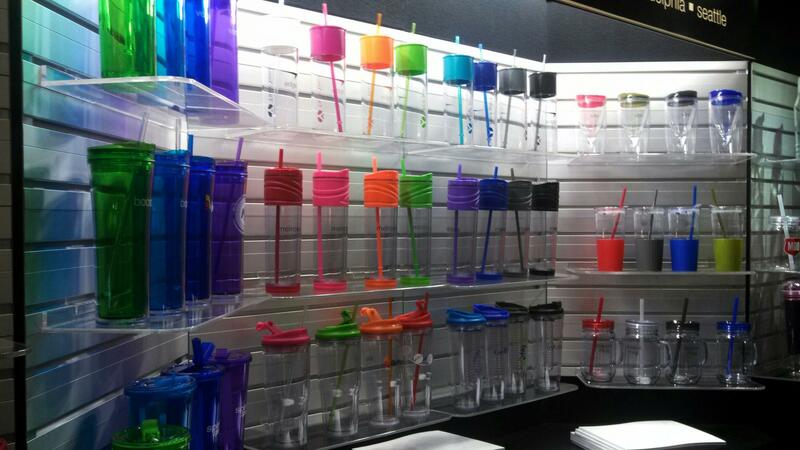 Custom drinkware in 2014 takes a casual twist – we’re talking Solo cup-style tumblers and mason jars. With color-coordinating lids, straws and handles, you can show off your brand in cool, laid-back style. This latest crop of drinkware is what you’d want to top off with sweet tea or lemonade – it’s perfect for company picnics and summer events. We’ve kept you up to date on plastic bag bans in the United States, and you likely already know about the NFL’s policy limiting the size and type of bags allowed into stadiums. Not surprisingly, clear custom stadium bags were a huge story at the show this year. There was no shortage of clear bags, and many also incorporated the neon trend with brightly hued handles. Custom cell phone accessories – specifically cell phone wallets – were all the buzz on the tradeshow floor. Everyone had a variation of the cell phone wallet, that handy pocket that adheres right to the back of your phone. Other trendy accessories included phone cases and loungers. Think mobile for a modern promo in 2014.